Sports-Fitness-Solutions Newsletter, Issue #038--BOOT BUILDING SECRETS! It seems like everyone has been asking me how to shape up their behind lately, so I've decided to let you in on a few of my closely-guarded booty-building secrets. Most of my clients have one of the following things to say about their bum: 1) My bum is too big; 2) My bum is too saggy; or 3) My bum is too flat. Now let's attack each of these challenges with solutions that will give you the best booty ever! My bum is too big. #1: Run: Running is a great way to burn off extra body fat while developing strong glutes. Follow these 4 tips to target your glutes while running: To target your glutes focus on extending your hips and keeping your chest lifted. Roll all the way forward onto your toes with each step, in order to engage more of your glutes. Run up hills, stairs, or on the treadmill at an incline. Run on a sandy beach or gravel path – the uneven surface forces you to work harder to stabilize your lower body. #2: Elliptical Workout: The elliptical works well for streamlining your behind – but only when used properly. Follow these 4 tips to get the most from your elliptical workout: Posture matters. Don't drape your upper body over the front of the elliptical machine – this will bring the focus to your quads and lower back instead of your glutes. Instead keep your back straight and posture good. Put the incline of your machine higher than seven percent. This will ensure that the emphasis is on your glutes instead of your quads. Push down with your heels with each stride. Also sink down into a squat for 30 second intervals while striding. Let go of the handles. This will force your core to stabilize you. #3: Swim: Swimming laps is a sure way to burn tons of calories. Follow these 4 tips to get the most from your time in the pool: Start each lap with an explosive push from the wall. Place the soles of your feet flat against the side of the pool, bend your knees and explode forward with your legs. Use flippers. Sounds silly, but try a few laps with a kickboard and flippers and you'll quickly feel the intense emphasis on your glutes. Vary your kick. Go from flutter to froggy kicks to target all of your glutes. Try some in-water squat jumps: stand in chest-level water with feet shoulder width apart, toes turned out. Bend your knees and lower your hips down then explode upward, pushing through your heels. My bum is too saggy. The solution to a saggy bottom is simple target your glutes. Try the following 3 bum-lifting exercises at home, the best part is these require no equipment. My bum is too flat. To build a shapely behind you'll need to head to the gym. The following 3 booty-building exercises will give your bum a serious shape-changing workout. Want to get your best booty as quickly as possible? Get started today on working at it. If your run into trouble or want some help feel free to call me, that's why I'm here. I'll help you with a unique fitness program that will get you on the fast track to your best booty ever. On last thing. Want to boost your booty results? Then get a handle on your diet. Oversized portions add extra calories to your diet, resulting in a bigger booty than you bargained for. To cut your bum down to size, simply eat good, healthy unprocessed foods in controlled portions. That's a sound diet for any workout program. 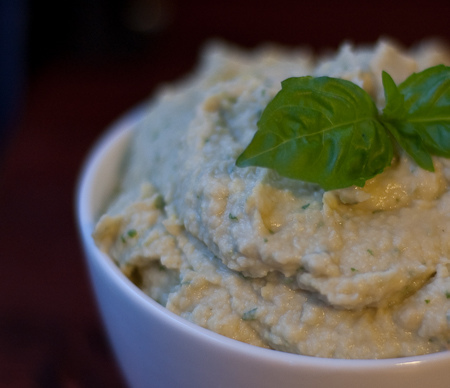 White Bean Hummus is a great alternative for a dip or to use instead of creamy dressings or cheese in your sandwich. The hummus is filled with protein and fiber, both important for building your best booty; and a healthy diet. Simply throw everything into the food processor and blend until smooth and creamy. Spread onto bread or use as a dip for cut veggies. Either way it's great and healthy. One serving equals: 124 calories, 1.6g fat, 20g carbohydrate, 5.5g fiber, and 7g protein.